New Delhi: Italian fashion apparel firm Benetton is looking to double the number of its stores to about 850 in India in the next five years to tap the growing market which is among its top five globally. When asked about the expansion plans, Benetton India MD Sanjeev Mohanty told PTI: “The brand has been present in India for the last 20 years, but most of the expansion in terms of new stores has happened in the last 5-6 years. We will continue to grow aggressively here." He, however, declined to comment on details such the number of new stores planned and investments for it. Earlier the company has been primarily focusing on the top ten cities in India but given the growth in brand awareness and disposable income levels, even smaller cities and towns will see lot of action, he added. “We are very much focused on the smaller markets as the opportunity there is huge," Mohanty said. Going ahead the company will continue to open only franchise-operated stores irrespective of policies regarding the retail sector in the country. “Even if FDI in single brand retail is opened up, we will continue to operate like a wholesaler and follow the franchise route," Mohanty said. He said almost 100% of the products are sourced from India. 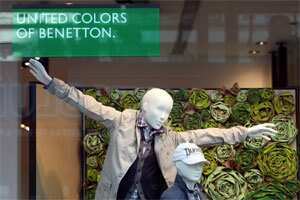 Benetton on Thursday showcased in India a series of art installations designed Cuban designer Erik Ravelo. The four installations of the Lana Sutra (inspired from Kama Sutra) global art project will be showcased at Benetton stores in India for the next fifteen days and will travel to other parts of the world, Mohanty added. Benetton has recently rolled out a controversial marketing campaign ‘Unhate´ showing various political and religious leaders lip-locking.